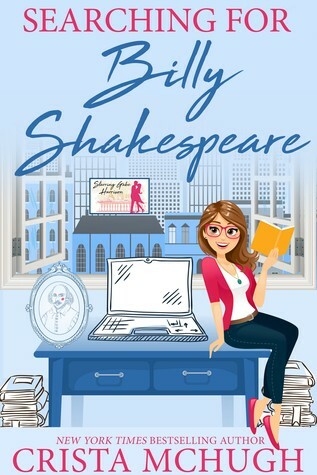 The cover for Searching for Billy Shakespeare is what caught my attention. The cover actually had me thinking this was one of Crista’s YA reads. In fact, it’s a New Adult Romance. Searching for Billy Shakespeare marks my first time reading Crista McHugh, who has been on my author reading wish list for awhile. I have to admit, the first 20% of the book was not what I was expecting. In fact, I wasn’t sure if I was going to like the book. I wasn’t getting a romance vibe and the heroine, Kate, just seemed nerdy and square. She was pretty much just lost in her own world of William Shakespeare. What kept me reading was my curiosity about how Kate’s life would turn out. But, I’m getting ahead of myself. Kate Mireau is a twenty-seven-year-old graduate student at Columbia. For the past three years, she’s been working day and night on her dissertation on William Shakespeare. In an out of character move, she takes the night off only to discover her boyfriend of ten years has been cheating. While tragic, this forces Kate to make a fresh start with her life. Kate’s fresh start includes a move from Brooklyn to the Upper East Side, a trust-fund roommate, plus experiences and opportunities she’s never had. This new start also puts her on the path to meet Gabe. Kate and Gabe started their love affair in a way that I really, really loved. Their first interaction was by phone. And they continued to have a phone relationship and ultimate friendship by phone, long before they ever actually laid eyes on each other. The two actually started having deep feelings for one another long before Kate knew Gabe was a Hollywood superstar. But their road to happiness isn’t going to be easy. Gabe’s Hollywood lifestyle doesn’t really go well with Kate’s quiet, graduate lifestyle. The two are going to have to learn to make some major compromises to find the happiness and love they want. Searching for Billy Shakespeare has very likeable characters. I really fell in love with Kate and Gabe. The secondary characters were good and definitely helped drive the story. However, I was disappointed that major events occured in the secondary characters lives that affected Kate and Gabe, but the resolutions weren’t revealed to readers. This apparently is a spin-off of Crista’s Kelly Brothers series, so maybe there’s another story in the works featuring Gabe’s sister.